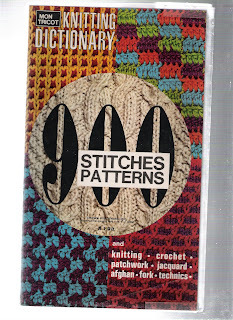 My first stitch dictionary was this one, pictured on the right. Published in the 1960s and translated from the French, it was the first such dictionary I had ever seen. As a newly adult knitter I spent a lot of time with it, learning about techniques and discovering that there are many ways to put knit and purl stitches together- 900 actually. I also learned the names of stitches, and that created some confusion. The translation is from French to British English rather than American. In the crochet section in the back the American terms are given in parentheses; in the knitting section the British and American usage is very close, except occasionally in the names of stitches. I was reminded of this when I cast on for Kim Hargreaves Darcy sweater. (see previous posts on Darcy here and here. )The instructions say to work in moss stitch, but if the directions for moss stitch are included, I couldn't find them. Luckily I knew how to make moss stitch thanks to Mon Tricot. It is simple: establish a row of k1, p1, and proceed to purl the knits and knit the purls throughout. But a few days earlier I had been looking at instructions for the Minimalist Cardigan from Interweave Knits (Fall 2007). The stitch pattern for this sweater is also called moss. This pattern did include the directions for moss stitch, but the moss stitch it described was a version of double moss, not the moss stitch I knew from Mon Tricot. I remembered that the American and British versions of moss stitch are different. When Americans say moss stitch they usually mean double moss. Maybe it's not a big deal, but if you didn't know that, you might use the wrong stitch in making the Darcy Jacket, since the stitch pattern isn't specified. Anyway, I went looking in Mon Tricot, and in my other stitch dictionary, Harmony Guide to Knitting Stitches and found some variations. Double Moss Stitch - row 1: k2, p2; row 2: as row 1; row 3: p2, k2; row 4: as row 3. Double moss is much chunkier than single moss. Single moss is fine textured and daintier looking, but the fabric it produces has a lot of firmness and body. I like single moss better, but of course each has its uses. All moss stitches look the same on both sides. Harmony Double Moss Stitch - row 1: k1, *p1, k1; row 2: p1, *k1, p1; row 3: as row 2; row 4: as row 1. As with the first double moss, this one boils down to knit the purls and purl the knits on odd numbered rows; knit the knits and purl the purls on even numbered rows. Seed stitch uses purl bumps decoratively on the right side of the fabric, unlike moss which depends on the interaction of knits and purls to form the fabric. Seed stitch is thus one sided. The even numbered rows in the two basic seed stitches (seed and double seed) are all purl, like stockinette. Single seed is basically stockinette (k on one side, purl on the other side) with purls superimposed on the knit side in a staggered pattern. In her comment on the above post, the nameless blogger of Wool Enough and Time has pointed out that what I am here calling moss stitch is usually called seed stitch in the United States. Sure enough, I was coincidentially looking at Cheryl Oberle's Folk Shawls and Barbara G. Walker's Learn to Knit Afghan Book and see that what they call seed stitch is what I describe above as moss stitch. This adds to the confusion especially since my Harmony Guide, which I cite for a variation of double moss, uses moss stitch as the name for the 2 row, k1, p1, not seed. Can you tell that I like classification and organization? I suppose that aside from my quirk, the names don't really matter, as long as everyone knows what you're talking about. Cheryl and Barbara Walker give directions for the stitch that they call moss, so no harm done. But it does bother me that the Kim Hargreaves Heartfelt book does not tell you how she wants moss stitch done. She just tells you to do moss stitch. The saving grace is that the photo of the sweater shows the stitch clearly, so you can do it whether you call it moss or seed. Thanks Wool Enough. I enlarged the photo of your book's cover to take a closer look and noticed the price -- $1.98. Ah, those were the days. 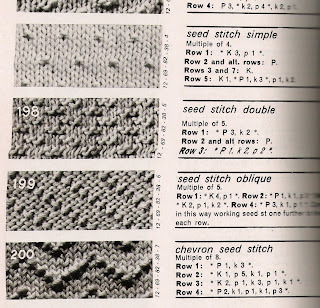 I have a 1975-era knitting book that completely agrees with Mon Tricot re seed and moss, but more recent manuals almost always call the 1X1 version "seed" and the 2X2 version "moss". It's either a change over time, or perhaps the USA being out of step with the rest of the world. Here's another clue that may pertain to the old "Mon Tricot" books (I also own those from the 70s): the French call "seed stitch" "point de riz" or "rice stitch", so the term you encountered is most likely a literal translation from the French. In a similar vein, Katharina Buss's "Big Book of Knitting", translated from the German, uses its own peculiar translations for a number of techniques (such as tubular cast on and bind off and several others). But the book is so good it is well worth staring at the photographs and figuring out the more common American term.